Obesity does not only affect humans. In North America, our pets are putting on the pounds and more and more animals are developing weight-related medical conditions that were virtually nonexistent 20 years ago. Our pets are getting osteoarthritis, diabetes, pancreatitis, anterior cruciate ligament injuries, and heart and respiratory disease. Today, obesity is one of the fastest-growing health problems in our canine friends. 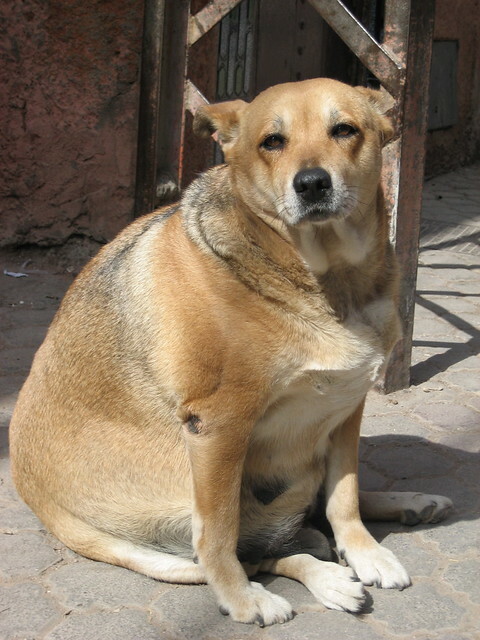 A 2008 study by the Association for Pet Obesity Prevention estimated that 44% of American dogs, or roughly 33 million, were overweight or obese. According to veterinarian Dr. Jody Kincaid, commercial food is one of the major causes of obesity. He does not recommend most commercial dog foods as these are corn-based, and dogs are not designed to eat corn. Dr. Kincaid suggests raw meat and gluten-free food. He says raw is better because meat contains enzymes and minerals that are destroyed when cooked. A lot of dogs become overweight due to improper diet and lack of exercise. In addition, your canine friend should have a waist. He shouldn’t look like wrapped candy – skinny on both ends and round in the middle. A lot of pets’ eating habits become irregular when it’s the holiday season, as owners tend to feed their dogs table scraps during this time of the year. Dr. Hofve cautions against fatty foods. While you can let your pooch have turkey and ham in moderation as a treat, she advises pet owners not to overfeed their animals during the holidays. It is every dog owner’s job to keep dangerous foods such as onions, chocolate, grapes, and raisins away from their pets. Also, don’t give your pooch outdated foods, or those that have been in the fridge for a while. “If it’s relatively healthy for you and me, it will be relatively healthy for your pet in most cases. If it’s not good enough for us to eat, don’t give it to your pet,” Dr. Hofve says. And this is why there can be trouble during the holidays. Dogs can get sick easily when they suddenly get a bunch of turkey fat, for example, so Dr. Kincaid recommends giving scraps in small quantities. Like humans, dogs also need proper diet and sufficient exercise to live a long and healthy life. Next Next post: January 14th – Happy National Dress Up Your Pet Day!